Discover the natural splendor of the Atacama Salt Flats on a full-day tour from San Pedro de Atacama. Accompanied by a knowledgeable guide, visit the luminescent salt flats of Soncor; observe fabulous flocks of brightly colored flamingos in Los Flamenco National Park; and explore the luscious lagoons of Miscanti and Miniques. Feast upon a traditional Chilean lunch in the charming village of Socaire, and browse the bespoke boutiques of Tocanao for special souvenirs and artisan treasures. After hotel pickup in San Pedro de Atacama, relax during the scenic drive to one of the world’s largest salt flats in an air-conditioned minivan. 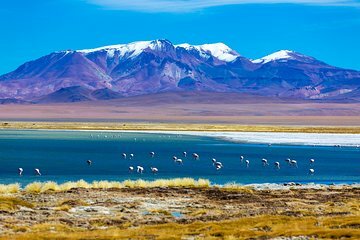 Arrive at the Chaxa Lagoon, a spectacular section of the Salar de Atacama (Atacama Salt Flats) that lies within the Reserva Nacional Los Flamenocs (The Flamingos National Reserve). Explore the area for approximately an hour, capturing the vibrant color of flamingos on film. Home to a diverse variety of wildlife, you’re sure to spot some fascinating creatures during your stop. Continue on to the Miscanti and Miniques Lagoons, volcanic bodies of water situated at an elevation of 13,780 feet (4,200 meters). Created by the cooling of molten lava, the lagoons provide a visual spectacle with their dramatic landscape and volcanic backdrop; explore the area on foot during a relaxed stop in the area. Next, travel to the provincial village of Socaire to feast upon local specialties inspired by regional produce. Famed for its unrivalled culinary skills, the restaurant provides an appetizer, main course, desert and drink that is sure to pleasure the palate. Revitalized, venture to the village of Toconao; admire the quaint village church and browse the craft shops for artisan treasures before returning to San Pedro de Atacama in your comfortable minivan. The scenery was amazing! Every place we visited was breathtaking. Max was an excellent tour guide. He was very knowledgeable. Max was also a great photographer and took lots of photos for us as well as others on the tour. I want to echo the advice from a previous reviewer, bring snacks because lunch is not served until around 2:00 pm. Also, there is a large chunk of time when there are no bathrooms. This would hold true regardless of which tour company you used. I would highly recommend this trip. Amazing day trip! Our guide Gustavo was really kind, professional and nice. Highly recommended. Great tour! Knowledgeable guide, well organized--my only negative comment is that we needed more time at the last stop--the flamingos! I could have done with less lagoon in order to make that happen-but overall, this is a wonderful tour where you will see beautiful, humbling sites. The bus was comfortable, the tour guide's English was exceptional, and lunch was very good. The day is long on the bus, but the sights were amazing! Every time we thought we had seen the best thing, there was another destination that was even better. There is a long time between rest room stops and lunch was pretty late in the day....so bring snacks. There is also a big temperature range so bring warm and cool clothing....they allow you to keep backpacks, etc. on the bus. The price was a real bargain and the time was well worth it, even with our limited amount of time in the Atacama desert. The landscape was breathtaking and almost Martian. The lagoon pristine; the emerald water unforgettable. The flamenco reserve was very good, but it'd be good to have more time there. Ended at Tocanao which was a bit boring as the guide did not explain much but we tried ice cream with local flavours! The guide was excellent. The places visited were fantastic. Bird watching was good. Only downsides were size of group was a bit large and pick up was not punctual. We were given two times, namely 08:00 and 08:30 but were not picked up until 08:45. Was an nice day! Long day wich ended with thunder and rain. But for this time we have had visited all places and were safely in bus on the way back to San Pedro de Atacama. The most impression were Flamencos National Reserve, Aqua Calientes volcano and Salt lake beside this, Socaire village - very tasty late lunch!!! By the way I really enjoied the scenery on the way back. Mostly there was Atacama itself on leftside and Andes under heavy thunder on the right side! Great day out with a super guide who spoke really good English. 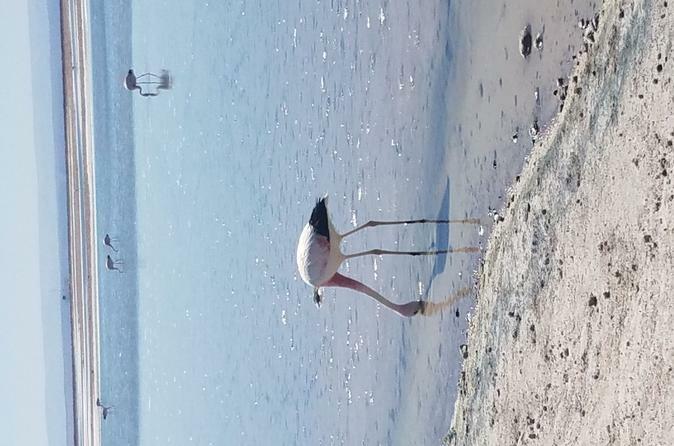 Didn't see that many flamingos but country was wonderful.